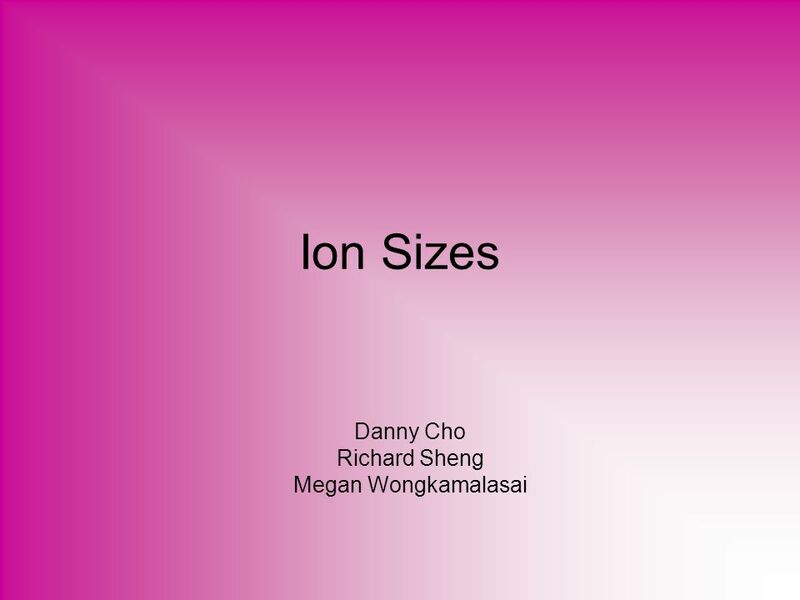 Ion Sizes Danny Cho Richard Sheng Megan Wongkamalasai. 2 What is Ion Size? 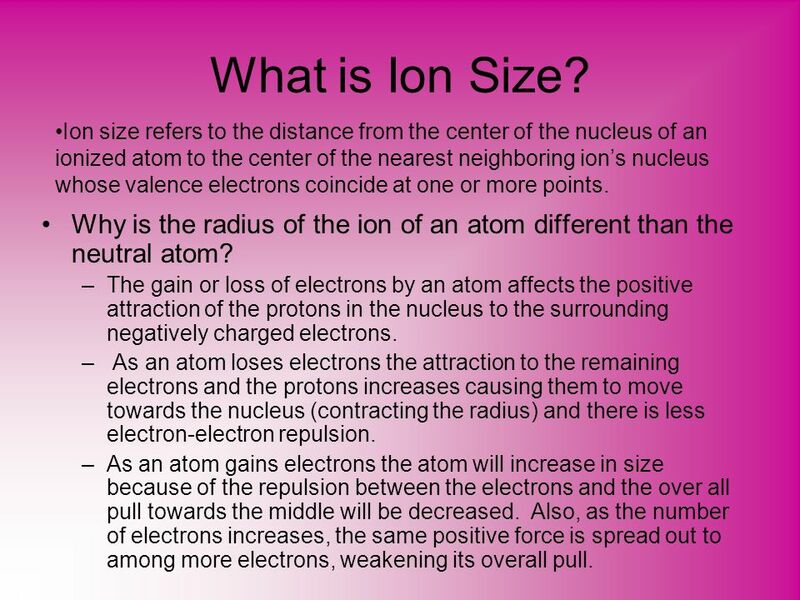 Ion size refers to the distance from the center of the nucleus of an ionized atom to the center of the nearest neighboring ion’s nucleus whose valence electrons coincide at one or more points. 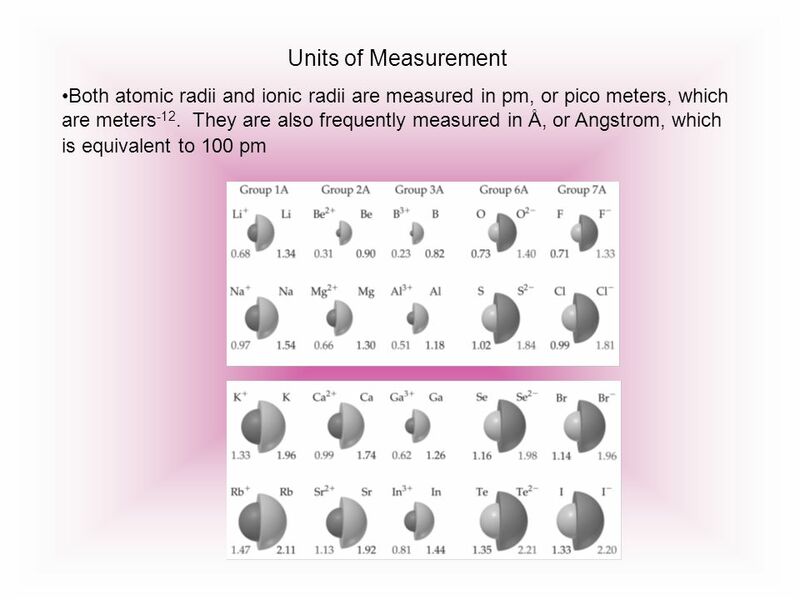 Why is the radius of the ion of an atom different than the neutral atom? The gain or loss of electrons by an atom affects the positive attraction of the protons in the nucleus to the surrounding negatively charged electrons. As an atom loses electrons the attraction to the remaining electrons and the protons increases causing them to move towards the nucleus (contracting the radius) and there is less electron-electron repulsion. As an atom gains electrons the atom will increase in size because of the repulsion between the electrons and the over all pull towards the middle will be decreased. Also, as the number of electrons increases, the same positive force is spread out to among more electrons, weakening its overall pull. 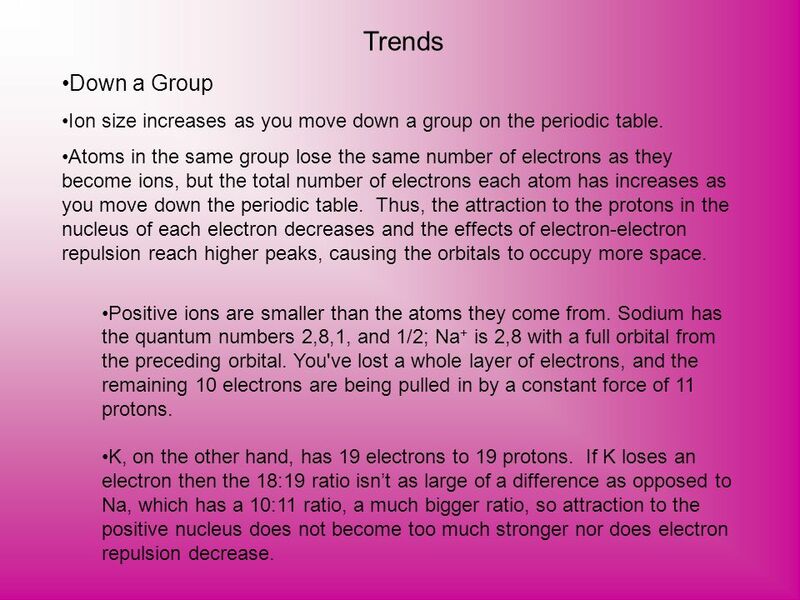 3 Trends Down a Group Ion size increases as you move down a group on the periodic table. Atoms in the same group lose the same number of electrons as they become ions, but the total number of electrons each atom has increases as you move down the periodic table. Thus, the attraction to the protons in the nucleus of each electron decreases and the effects of electron-electron repulsion reach higher peaks, causing the orbitals to occupy more space. Positive ions are smaller than the atoms they come from. Sodium has the quantum numbers 2,8,1, and 1/2; Na+ is 2,8 with a full orbital from the preceding orbital. You've lost a whole layer of electrons, and the remaining 10 electrons are being pulled in by a constant force of 11 protons. K, on the other hand, has 19 electrons to 19 protons. If K loses an electron then the 18:19 ratio isn’t as large of a difference as opposed to Na, which has a 10:11 ratio, a much bigger ratio, so attraction to the positive nucleus does not become too much stronger nor does electron repulsion decrease. 4 Across a Period The trend across a period is not direct, but does decrease overall. The metals (cations) decrease in ionic size until the non-metal (anions) come up, at which there is a drastic increase in ionic size, after which ionic size decreases once again. 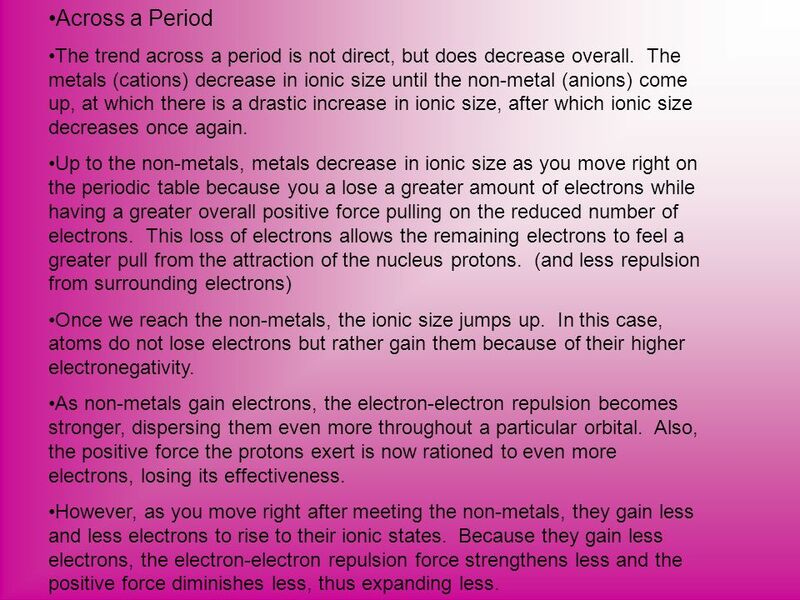 Up to the non-metals, metals decrease in ionic size as you move right on the periodic table because you a lose a greater amount of electrons while having a greater overall positive force pulling on the reduced number of electrons. This loss of electrons allows the remaining electrons to feel a greater pull from the attraction of the nucleus protons. (and less repulsion from surrounding electrons) Once we reach the non-metals, the ionic size jumps up. In this case, atoms do not lose electrons but rather gain them because of their higher electronegativity. As non-metals gain electrons, the electron-electron repulsion becomes stronger, dispersing them even more throughout a particular orbital. Also, the positive force the protons exert is now rationed to even more electrons, losing its effectiveness. However, as you move right after meeting the non-metals, they gain less and less electrons to rise to their ionic states. Because they gain less electrons, the electron-electron repulsion force strengthens less and the positive force diminishes less, thus expanding less. Download ppt "Ion Sizes Danny Cho Richard Sheng Megan Wongkamalasai." Periodic Trends Mrs. Coyle Chemistry. Periodic Trends. Describe factors that affect electron position around a nucleus. Include: nuclear charge, distance, shielding. Explain periodic trends. Periodic Trends. 2 What is the radius of a circle? What would the atomic radius be? 2. CI 3.2 The size of ions Ions in solution Attractions to other ions and to water molecules depend on: Charge on the ion Size of the ion. The Periodic Table Periodic Properties. Periodic Trends Objectives: 1. Define the term periodic trend. Drill – 11/19 What is meant by “periodic trend”?. Structure of the Periodic Table Aim PT2 – what are some of the characteristics of elements we study using the Periodic Table? Periodic Trends. Atomic Radius Defined as half the distance between the nuclei of two atoms Going across the periodic table ◦ But why are they smaller.